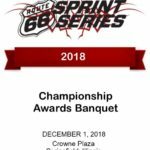 With the season finale of the 2018 Route 66 Sprint Series presented by MG Tires and Franklin Motorsports coming up in a couple short weeks, there is plenty on the line. 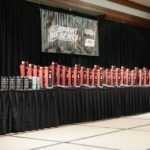 The Kyle Adkins Engine Builder of the Year award is still up for grabs, with Comet Kart Sales looking to defend their title from 2017. Comet is in a strong position again in 2018, but we won’t know for sure until after the dust settles in Springfield. The Chassis of the Year was won handily last year by Merlin, but things look a little tighter this year. 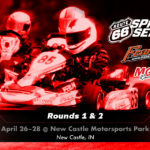 Again, Mid-State Kart Club will be the site of the final battle for the chassis brands. Many driver Championships and top finishers are yet to be decided. Here are a few that we will be paying close attention to. KA100 Sr.: Colton Ramsey (Exprit) is shown at the top of the charts now, but after drops, Josh Hotz (Merlin) is the leader by about 71 points. Colton has the potential yet to get his 22 bonus points for attending all the events, which Josh missed one of the MRP days. This will close the gap down to just 49 points. Ramsey has a 3rd place finish banked already, so he can afford a bad day, while Hotz has a little less to work with, and needs 2 solid days in Springfield. Steven Dial (Compkart) is not mathematically out of the equation, but his bid for a championship is a longshot at best, requiring an unlikely disastrous weekend for both Hotz and Ramsey. Micro Swift: Cameron Brinkman (Merlin) and Aryton Grim (Nitro) have matched each other’s pace all season. Brinkman holds a slim 20 point lead as of today. Logan Julien (Tonykart) is not far behind. This one will be up for grabs right up to the very end! X30 Jr.: Nicholas Terlecki (Merlin) sits on top right now by 156 points over Garrett Adams (FA Kart). However, Terlecki will be unable to attend Rounds 11 & 12, as he will be competing at the IAME International Final in Lemans, France. This leaves the door wide open for Adams, as it is still mathematically possible for him to make up the difference. He is also eligible for the 22 bonus points for competing in all events. X30 Sr.: There is still a shootout to be had in this class. Alexander Kardashian (Topkart) is listed first right now, but after drop races are subtracted, Austin Schaff (Merlin) is actually on top with 1894, Kardashian second with 1879, Armin Cavkusic (FA Kart) third with 1753, and Lane Vacala (Compkart) fourth with 1683. Kardashian and Vacala are the only ones in the top 4 that still are eligible for the 22 bonus points. This one will come down to the wire. The Yamaha classes are pretty close to be having the championships already settled, but there certainly will be some shuffling in the top 5 before the weekend is over. Registration is still open online, until Sep. 29th. Time to give your final push toward the finish line of the 2018 season!